Product information "Bitburger Premium Pils 5 liter keg 4,8% vol"
Accomplished pilsner taste, brewed for almost two centuries only the best ingredients according to the German Purity Law. His brief taste of fresh, Bitburger Premium Pils for most draft beer in Germany. From the elegant longneck bottle to a 5-liter keg - a Bitburger Premium Pils for every occasion and all occasions. What unites all: the barrel fresh beer taste. 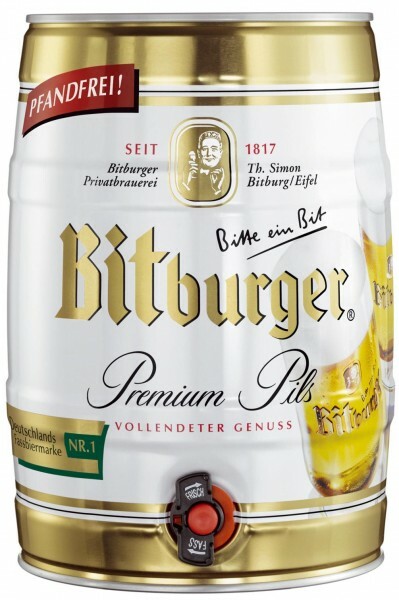 Related links to "Bitburger Premium Pils 5 liter keg 4,8% vol"
comment "Bitburger Premium Pils 5 liter keg 4,8% vol"
Customer evaluation for "Bitburger Premium Pils 5 liter keg 4,8% vol"
2 x Ulmer Pilsner Party barrel 5,0 liter 5,2% vol.